A CareFlight nurse undertakes winch training. Jim Jim Falls, Kakadu National Park: A nurse’s view as they are winched 35m to rescue an injured tour guide. Cargo ship off the Arnhem Coast: a flight nurse is winched 20m onto the deck for a patient, was placed into a rescue stretcher and hoisted to the helicopter. The nurse’s view during winching over a cargo ship off the Arnhem Coast. NT. Helicopter down-the-wire rescue is not normally associated with nursing clinical duty. Working as part of the Top End Medical Retrieval Service which CareFlight operates on behalf of the NT Government, flight nurse duties span incredibly vast geographic areas. Winching rescues are an important part of the day-to-day service that nurses with CareFlight provide to the community. Since taking over the Top End Medical Retrieval Service, 10 CareFlight nurses have been trained to undertake day and night down-the-wire rescues from the helicopter, over both land and water, including vessel transfers. The training is all about increasing CareFlight’s capability to answer rescue calls from emergency services across the Northern Territory and the Australian Maritime Safety Authority. The flight nurses have carried out more than a dozen significant rescues from difficult to reach places in recent years. Missions have taken place over rocky gorges, at the top of waterfalls and at night. The group have also performed water vessel transfers, an important aspect of medical rescue and retrieval services. It is not for the feint-hearted. Operations and training often take place in gusty and choppy conditions. Winch training on the ground at CareFlight’s Darwin base. Run over three days, CareFlight’s winching course begins on the ground with safe winching techniques, maintenance and applications of various rescue devices, communication methods and a broader understanding of helicopter operations/capabilities/limitations. All these skills are then consolidated in practical sessions during static and airborne evolutions. To successfully complete the course, the nurses are required to perform an advanced scenario where they utilise all their new skills. In 2016, advanced winching scenarios were held at Charles Darwin National Park for the first time. Local rangers volunteered their time and participated in the scenario. The nurses were winched in at 100 feet, allowing them to be exposed to the full effects of rotor down wash. They then located and assessed the ‘injured patients’, packaged them, identified a suitable extraction site, provided regular updates with the helicopter crew via communication tools, completed a stretcher extraction of the patient, and then were winching up with their medical packs. 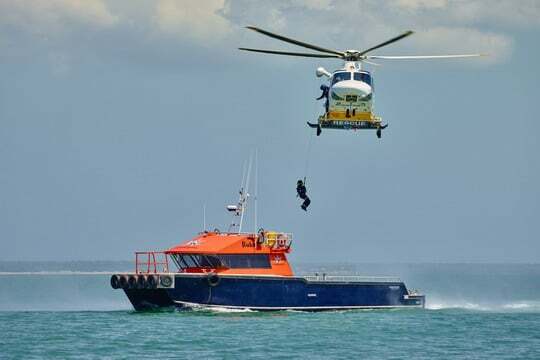 Flight nurses are winched down from the CareFlight Top End Rescue Helicopter onto Broadsword Marine who provided the vessels on Darwin Harbour. Photographer: Paul Arnold. CareFlight air crewmen conduct vessel transfer training for the flight nurses. The courses take in briefings, static training on the helicopter then actual hoisting onto and from a boat. On top of initial training, the nurses complete regular static and airborne training to maintain their currency. The nurses complete a fitness test every three months.